← Home, or on Vacation? When I say the name Pacific Northwest, one word comes to mind – OUTDOORS. I’ve always thought – and here comes a generalization – as though people who live there spend on average a much larger portion of their day outside. And as a result – or maybe just as correlation – they are generally more relaxed also. After visiting, I think this is true. We had the fortune of traveling to the Pacific Northwest and the end of summer, and what a trip! Sunshine literally every day, even in Seattle, which I hear is rare. A few points that are typical of (US) travel with kids that I had kind of forgotten about. No matter how attractive the Southwest Airlines fare – do not – under any circumstances – arrange a stopover in Vegas, if you have small children. I had forgotten there are slot machines literally everywhere in the airport. My almost two year old doesn’t quite understand the 18 and over only signs and didn’t understand why mommy wouldn’t let him push the buttons. Luckily for us, it was a short layover. Just don’t change planes with kids, if you can help it. With all their stuff, you really feel like a clown act, unpacking it all for a very short flight, to repack it, and then do that all over again on plane #2. We get caught by that rule every time. We see a cheaper fare by $100, and think, “oh, we’ll just change planes.” Once the day comes are we’re actually doing it, we say, “wow, it is totally worth the extra $100 to NOT change planes.” So find out what your dollar “breakeven” point is – and keep that in mind when booking. And if you must change, make it on the way there, when you have the most energy. 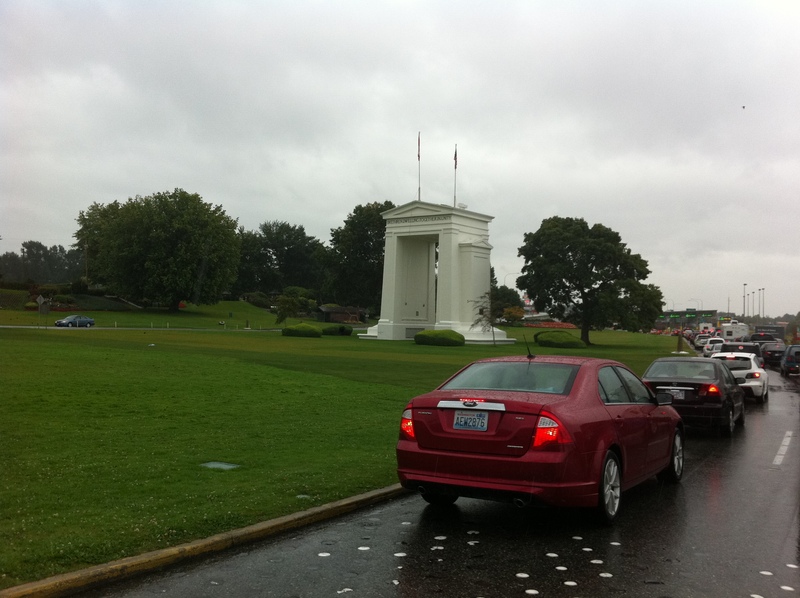 We landed at the Seattle Tacoma Airport, and jumped into the rental car and drove directly toward Vancouver, arranging a stopover in Bellingham, Washington, a cozy little seaside town. Knowing this would be 10 days filled with many hours in the car, I arranged to stay at a hotel with an indoor pool; sometimes my children, ages one and four, only remember the pool, or when asked what their favorite part of the trip was, it was swimming! We toured historic Fairhaven, with its cute downtown area, reminding me quite a bit of my home town of New Buffalo, Michigan, except with hills. Surrounded by unique shops, art galleries, and of course, coffee shops (more to come later), in the late 19thcentury Fairhaven was believed to be the next Chicago, with rumors that the second northern transcontinental railroad would be built to terminate there. However, these plans changed, and the railroad chose a site further south. But Fairhaven remains a very quaint, cute place, and with nationally designated historic district as most of its downtown. They have a fabulous town square they call the Village Green, pictured here, with its decorative wooden pergola, looking as if it was specifically made for hosting many outdoor events and farmers markets throughout the week. 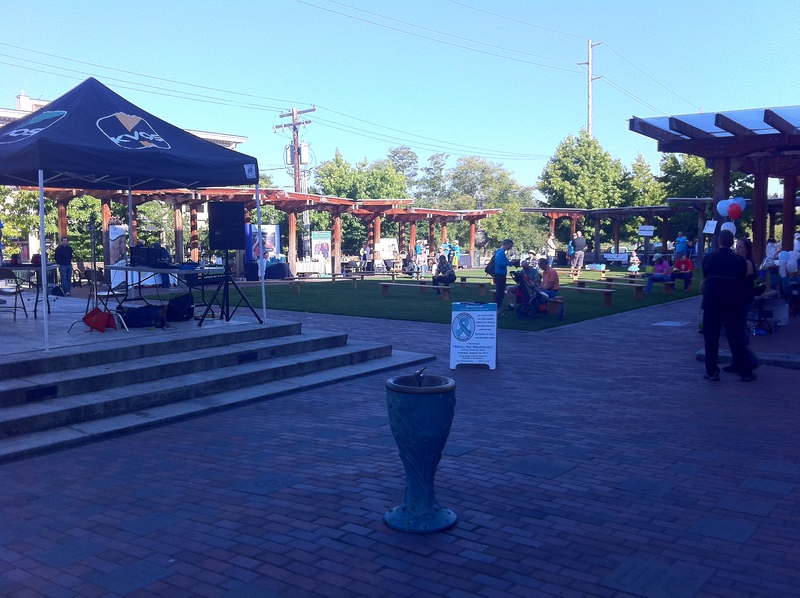 With a downtown as inviting as this, it just calls you to enjoy the outdoors. We ventured down the hill to the cruise terminal, where boats leave for Alaska and the San Juan Islands, both of which are places on my list to visit. By late morning, it was back in the car. about a three hour drive from Seattle, it was a place we couldn’t miss. We managed our way through Border Crossing in about 30 minutes, which was fun with kids. We discussed with our daughter what it was and why the officers checked our passports. 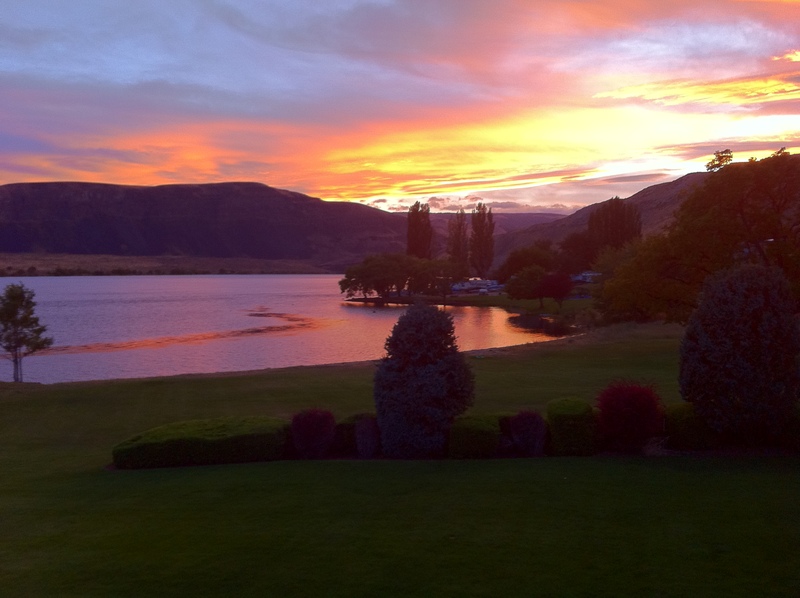 I love travel planning and sometimes I plan out each day – what we see, what we do, sometimes even where we eat! But for this trip, I had basically figured out the lodging, and that was it. It is sometimes fun not having an agenda. So we did what we usually do when we’re in a new city. First, ask, “What do all large cities have for kids? Zoos, aquariums, parks, museums, and in this case, waterfronts.” So into our GPS we programmed our first destination – the Vancouver Aquarium. Along the way, we were not at all prepared to enter Stanley Park, a 1000 acre oasis situated on the North coast of Vancouver, and the city’s first public green space. 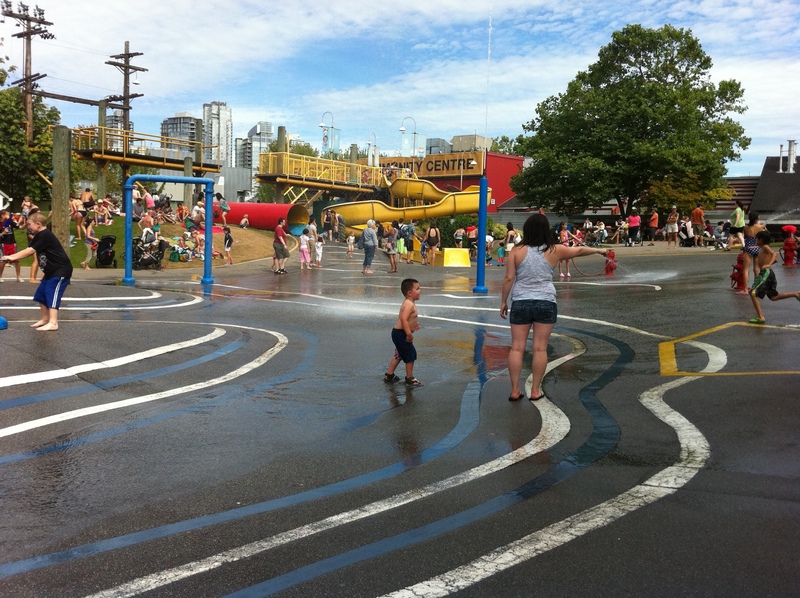 It was a beautiful a combination of forest, waterfront, play grounds, splash pad, trains, a theatre, and the reason we came – the Vancouver Aquarium. It had a unique indoor/outdoor footprint so we were able to enjoy the beautiful weather while we watched the dolphin show. After having lunch, we wandered into Klahowya Village, an authentic First Nations exhibit honoring some of present day British Colombia’s first inhabitants, and giving a glimpse into their culture and heritage. 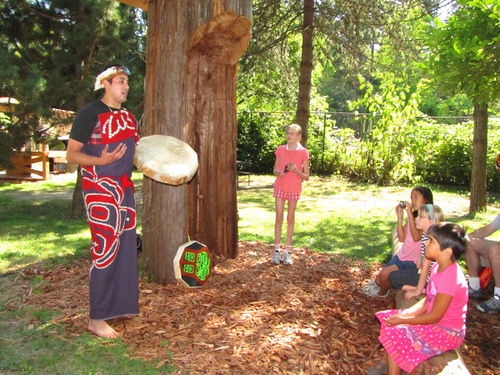 In the US, we use the term Native American for our native population; in BC and other parts of Canada, they use “First Nations.” There were aboriginal performers, dancers, story tellers, and crafts, and the miniature train ride was themed to an ancient legend “The Raven Saving the Sun.” What a great day! And it was fabulous to find so much green space in an otherwise very densely populated city. 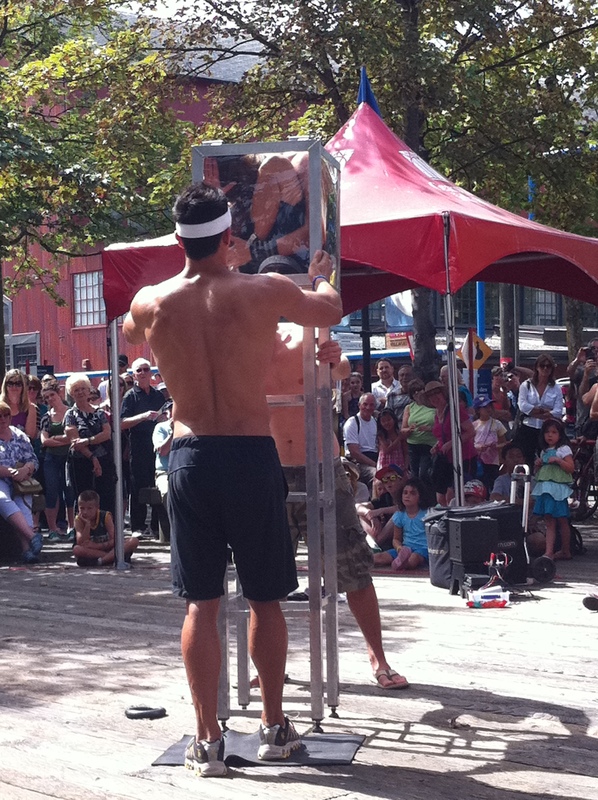 Street performer in a box! own kids market, complete with indoor climbing structure and outdoor splash/water park area. I was reminded of what I miss about large cities: being able to get just about any type of food you want, made any way you want, at any time of day you want. Indian at 2 a.m.? No problem. Gluten free pizza crust with no sugar added tomato sauce? Not an eye was batted. Our kids had a blast staying with friends that were close in ages to them, and we were lucky to come back to a home, rather than hotel room, each night. hidden gems; and its bounty is surprisingly similar to my home state of Michigan. We passed multiple farm stands advertising local berries, peaches, pears, corn, grapes and of course, apples. It was an opportune chance to speak to my children about farming and growing; my inquisitive four year old was excited to see so many “Christmas” trees growing in the mountains! I was impressed by one of the most perfect sunsets I’ve ever seen, and that is saying a lot since I grew up near the water. 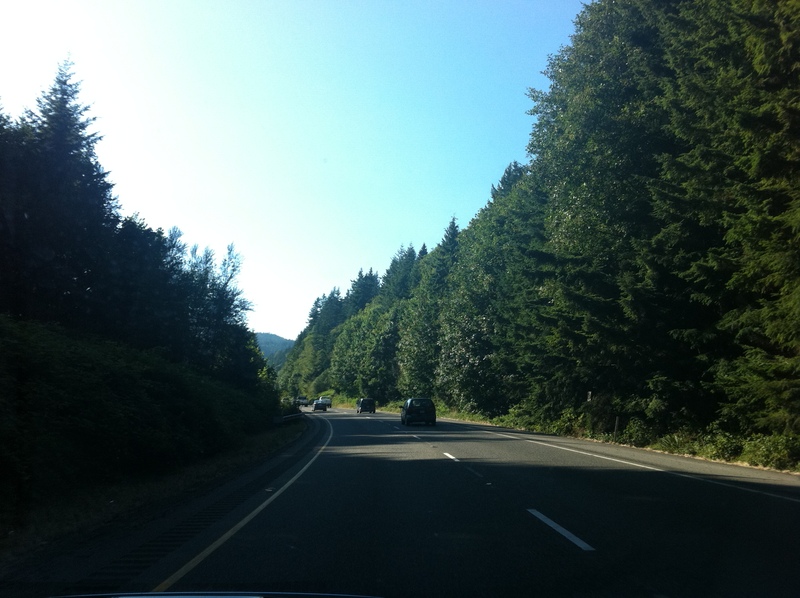 After a few days taking in the rural beauty, we headed to Seattle. Now, I took a few minutes before we left on our journey to speak to the children about what we would see. Not ever having been there, my knowledge was limited. But of course I knew of the Space Needle and monorail, which was maybe enough for my daughter’s four year old mind. We chatted a few minutes and that was it. So many days later when we arrive in Seattle, she is asking me about the “Space Pin.” My husband and I laughed out loud, and it just goes to show that sometimes kids really are listening to what you say even when they are standing there with that silent, confused look! 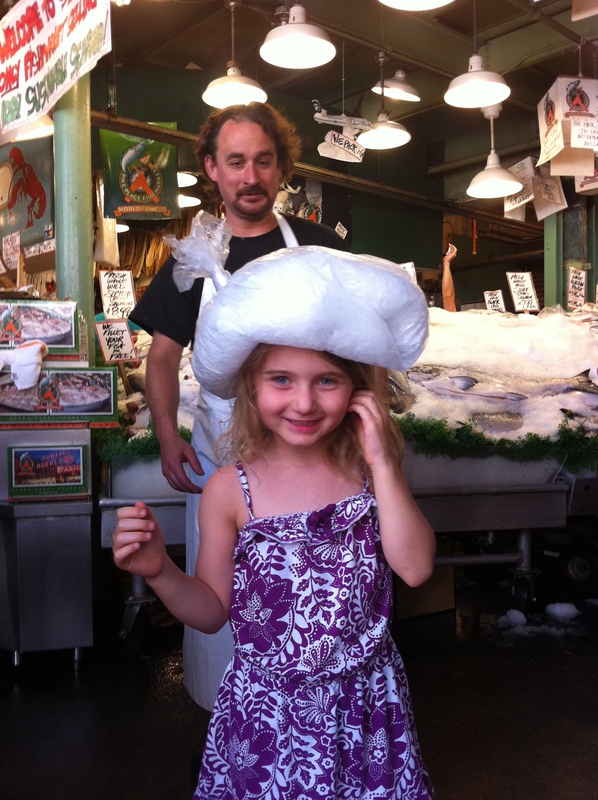 the celebratory ice pack on her head at the fish market. 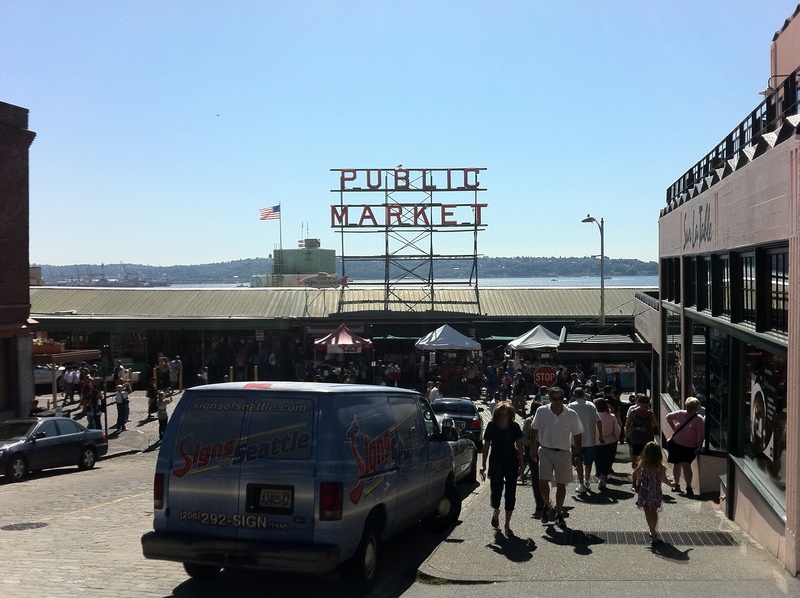 Pike Place Market is sometimes called the first farmer’s market. As the story goes, back in 1906, the cost of onions had risen tenfold in a year. Outraged consumers found a friend in city councilman Thomas Revelle, who proposed using a public space for farmers to sell their produce directly to the consumer, cutting out the middleman. The site would be at the corner Pike Street and First Avenue, and on that first day, eight farmers showed up to sell their bounty – and the crowd that showed up to buy was close to ten thousand! The produce ran out at 11:00 a.m., and many consumers left empty handed, but out of that chaos, a new concept was born. And by 1907, the indoor market building was completed, and each space was filled. Today, space is still rented by the day, and occupied by approximately 100 farmers and 190 crafters; and they are joined by 240 street musicians and entertainers, making Pike Place Market one of Washington State’s most frequently visited sites, by up to approximately 10 million people per year. There is great seafood and a good selection of ethnic foods. We wandered into an Indian grocer across the way from a German deli and store, near a Polish bakery and then an ice cream shop. And kudos to the German jerky we purchased – delicious! But even beyond Pike Place, there really is coffee on every corner. And there were even unique signs posted about where you can – and cannot – consume coffee – like this one at the Seattle Children’s Museum. 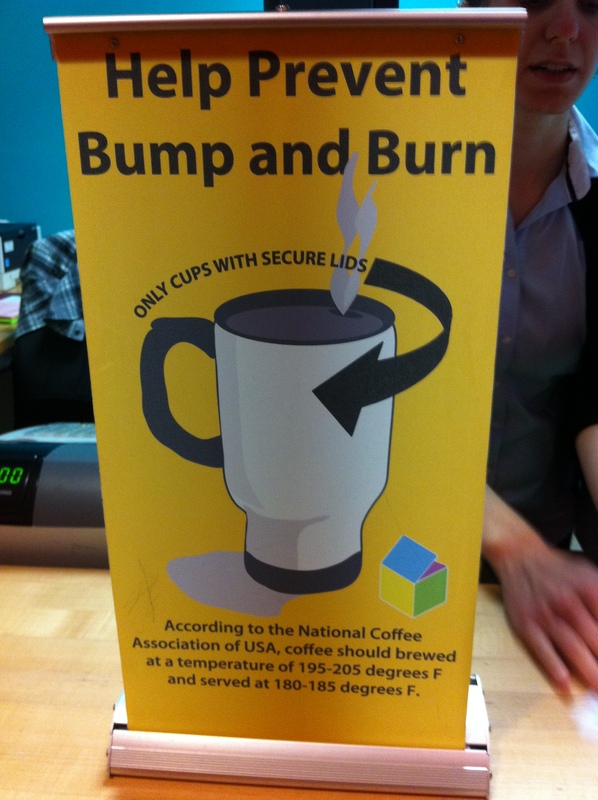 It reminded us yes, coffee is everywhere, but where and how you can consume your coffee can be regulated; according to the sign, it must have a spill proof lid, and it even gave brewing temperature guidelines! We walked for two days straight, mostly along Seattle’s waterfront, went up in the Space “Pin,” and spent our final day on a harbor cruise overlooking the markets on one side and Mount Rainier on the other. Ten days is a long trip with children. We had our requisite DVDs, car toys, coloring books, travel games, etc., which helped us get through the long stretches in the car. But you definitely wouldn’t need to force me to go back again. In fact, we moved around so much, that we really want to go back when we can have more time in each spot. What I tell my husband – once the kids are out of diapers and car seats (and sleeping through the night, which ours are not) – all of a sudden, travel will become much easier!